A dollop of whipped cream on top of a piece of pie is decadently delicious, but really bad for your waistline. A single tablespoon of whipping cream has more than 50 calories and 5.5 grams of fat; 3.4 grams are saturated fat, which is a hazard for your heart health. Fortunately, several easy substitutes exist that you can make with ingredients from your kitchen. Heavy cream whips into high-peaked fluff because of its fat content. You can make something similar -- although not as thick -- when you blend skim milk and a couple of ice cubes in your blender. The ice crystals give the milk structure and blending incorporates air into the liquid. Add a drop or two of vanilla or orange extract for a hint of flavor. 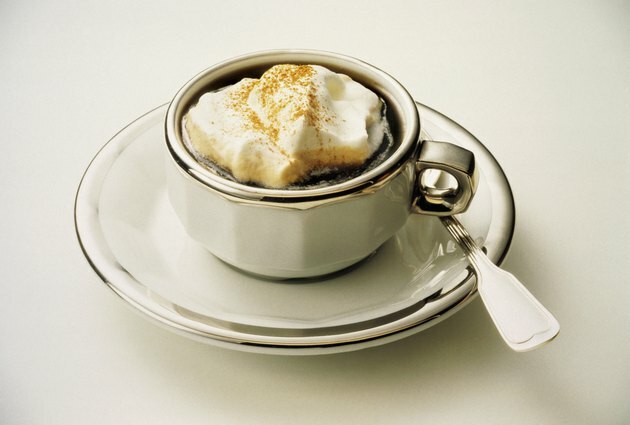 Prepared with half a cup of milk and a few ice cubes, whipped milk has just over 50 calories in 210 grams. Heavy cream is a lot easier to replace when you don't need it whipped. For sauces that call for cream, whisk skim milk with a few teaspoons of cornstarch as a thickener. For baked goods, use low-fat, plain Greek yogurt or cottage cheese whisked together with non-fat milk powder. A vegan substitute is tofu blended with soy milk.